Last night we brought an evening of surf cinema to Newquay, with a string of new flicks culminating in the showing of Ben Gulliver’s new cold water epic The Seawolf. A packed out gathering of surf film fans from all over the South West gathered at the Lighthouse Cinema in Newquay last night to enjoy a series of shorts, filmed all around the globe. The night kicked off with Nic Von Rupp’s latest instalment from the My Road series, presented by Monster Energy and featuring some of the most perfect tropical waves the world has to offer. Then, we journeyed down under to visit some crazy desert slabs with Andrew Mooney, produced by the fine folk at Adelio, followed by Globe’s newest flick ‘Cult Of Freedom’ featuring an all start cast and some crazy wedges. Next, we brought things closer to home, with a new profile short presented by Monster energy, on British surfer Jobe Harris, who’s recently taken up organic veg farming after being dropped by his major sponsor. Then, a short from Brixton, featuring the super talented Lee Wilson blowing up at home. And then it was time for the main event. The Seawolf bucks the trend of the long meandering, lifestyle heavy and, at times, overly verbose films that have come to dominate the cold-water genre, instead directing all attention on to the incredible waves, beautifully grandiose scenery and the surfing itself- the standard of which was ridiculously high. There was no voice-over about how cold it was, how tough it was to score, and how volatile the conditions were, just short humorous bursts of candid footage from the trips, sandwiched between top quality action sections. Many in the audience will have recognised an all-time sessions at Bagpipes, as well as a notorious Canadian slab which sat alongside sections from more anonymous snow-dusted hinterlands. 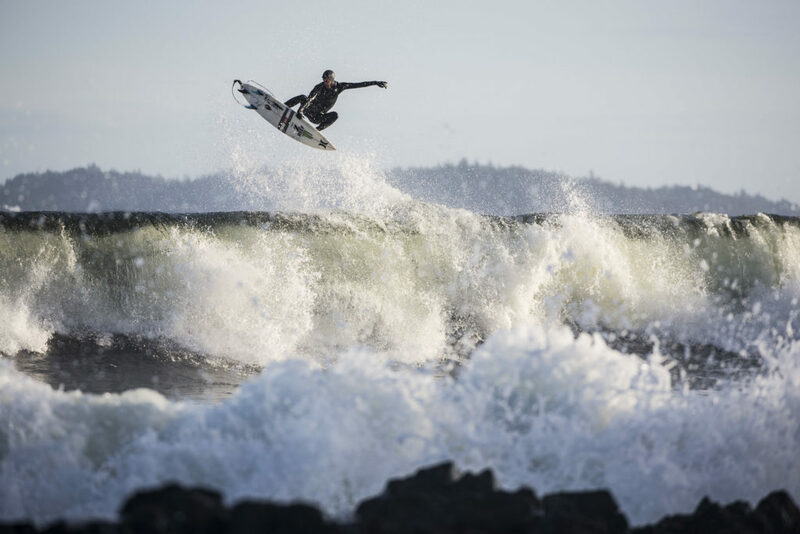 Despite the layers of neoprene, the aerial acrobatics on show, particularly from Chippa Wilson and Pete Devries, and the quality of the waves were on par with any surf film produced this year. We’ve got the same line up of exhilarating surf cinema in Bristol on Thursday and in Exeter on the 23rd of January. There are a very limited number of tickets left for both, so grab them while they’re hot. We’d like to thank our event sponsors and all who turned out to enjoy the films. Sign up to our newsletter here to be the first to hear about all of our future surf film screenings. You can also read more about the crew’s trip to Scotland in the upcoming Winter issue of the mag, which is due to drop in a few weeks!